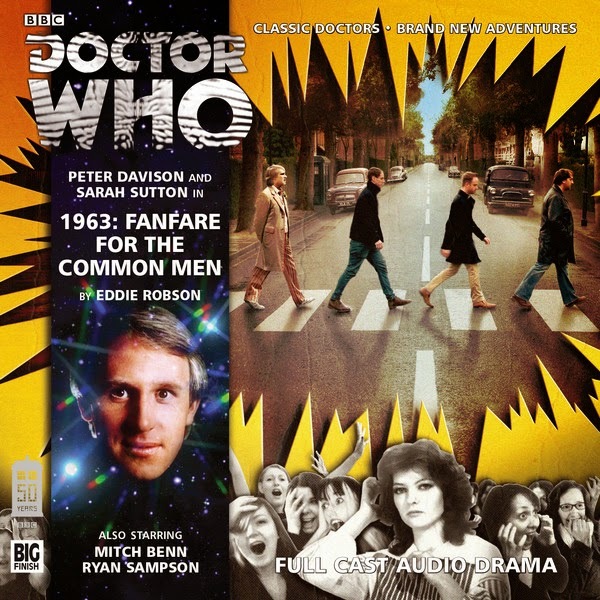 Doctor Who: Big Finish - 1963: FANFARE FOR THE COMMON MAN | Warped Factor - Words in the Key of Geek. The first entry in Big Finish's 1963 trilogy, marking 50 glorious years of Doctor Who, found the Fifth treating Nyssa to a bit of popular culture! His soft spot for the Beatles leads himself & his Trakenite companion to the London of the titular year, expecting to find the Fab Four stepping off a plane at the end of a European tour. Of course the Doctor has quite some experience of what his former companion Jamie once called ''flying beasties'' too! 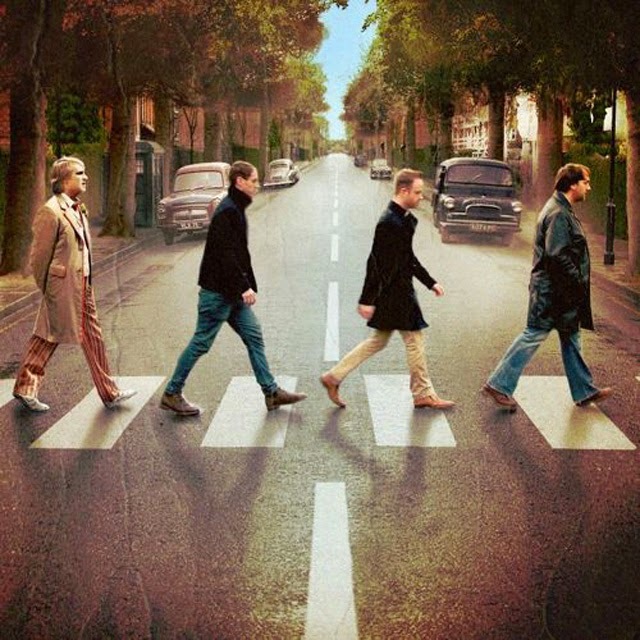 But the men who step out aren't exactly John, Paul, George & Ringo. Oh no. 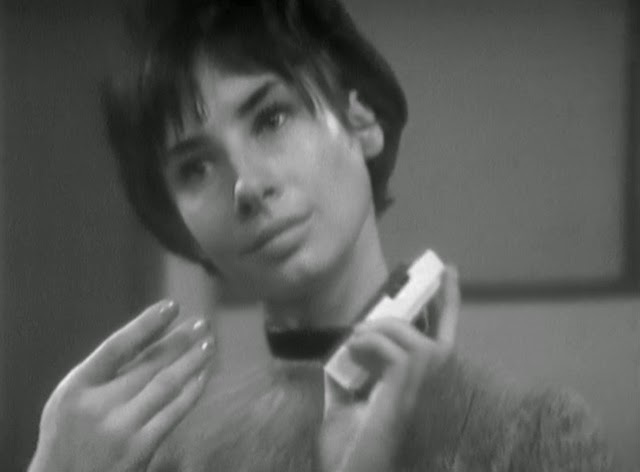 Remember the Common Men, whom Susan was heard listening to on the radio in An Unearthly Child? It seems Lenny Kruger, the Brian Epstein of the piece, has been doing his managerial job rather too well. Nyssa's trip into the late Fifties reveals that in this new time-line National Service has been extended beyond its recorded end in 1960, which resulted in much of the Common Men's competition being conscripted out of their way. Fast forward three years & the Beatles are following a very different path from that which came to an end with The White Album. Paul, the man who inspired an earlier hairstyle of the Doctor's, is now working as a shipping clerk, George is an apprentice in his family's business, John plays in a group known as the Famous Five with ''two Petes & a Chaz'' while Ringo was excused National Service due to health problems. Even the songs played by the Common Men have a distinct Beatles-esque flavour- Who Is That Man, Just Count To Three, Oh, Won't You Please Love Me........helped along no doubt by the presence of one Mitch Benn, the comic maestro who should be well-known to listeners to Radio Four's The Now Show who portrays Mark here! Only they aren't quite as Scouse as you'd think. They and Lenny are aliens from Byulnia, disguised as humans through the use of skin-suits much like the Slitheen faced by the Ninth Doctor in Aliens Of London/World War Three. But why go to all this effort? Simple. Lenny craves power, and what better means to achieve it than feeding off the popularity of the greatest band in this alternative Sixties England? 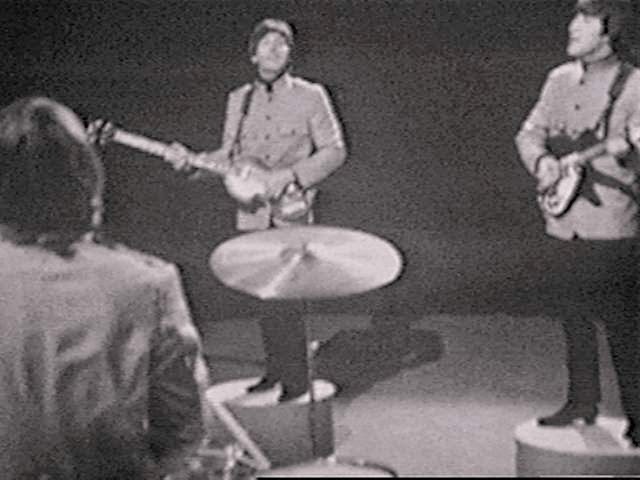 The use of a psychic amplifier is what causes the hysteria of the group's fans in an inversion of Beatlemania, while the band themselves are susceptible to his influence by means of subliminal suggestion. Several time-lines are created as part of Lenny's bid for power and the efforts to stop it, one of which features a Common Men equivalent to the various "Paul Is Dead" conspiracy theories that did the rounds in the Beatles' heyday. Here James of the Common Men is supposedly murdered by Lenny and replaced with a lookalike. The resulting bad press dents Lenny's designs on a greater future for himself! Ultimately he's put on trial anyway- but by way of a bit of background here's a little more on the bizarre rumours that McCartney had exited this mortal coil courtesy of The Beatles Bible. "'The 'Paul Is Dead' myth began in 1969, and alleged that Paul McCartney died in 1966. The Beatles are said to have covered up the death, despite inserting a series of clues into their songs and artwork. The story goes that at 5am on Wednesday 9 November 1966, McCartney stormed out of a session for the Sgt Pepper's Lonely Hearts Club Band album, got in to his Austin Healey car, and subsequently crashed and died. Somewhat improbably, McCartney was said to have been replaced by a lookalike, called variously William Shears Campbell or William Sheppard. William Campbell allegedly became Billy Shears on Sgt Pepper, while William Sheppard was supposedly the inspiration behind The Continuing Story Of Bungalow Bill - actually an American named Richard Cooke III. In fact, the crash never happened. Between 6 and 19 November 1966, McCartney and his girlfriend Jane Asher were on holiday, travelling through France and Kenya. However, a couple of relevant incidents did take place. On 26 December 1965 McCartney crashed his moped, resulting in a chipped tooth seen in the videos for Paperback Writer and Rain and a scar on his top lip, which he hid by growing a moustache. This is, of course, bunk- as he's still going strong today! The Doctor was first exposed to the music of his former group by means of the Space/Time Visualiser in The Chase during his First incarnation & rather liked them. "Troughton brought a light touch to his portrayal of the Doctor. Gone was the grandfatherly Edwardian gent of Hartnell’s Doctor and in came a scruffy, impish man complete with a dark mop of Beatle hair perfect for the swinging sixties. He brought a more youthful and sprightly quality to the role and his playfulness still shines through in the scratchy black and white footage that survived the BBC clear- out of the 1970s." That he did, though he was thwarted in his efforts to add I Am The Walrus to his recorder repertoire. "I am he & he is me- and we are all together?"